Meet the smallest single-board computer and access to GPIO pin. 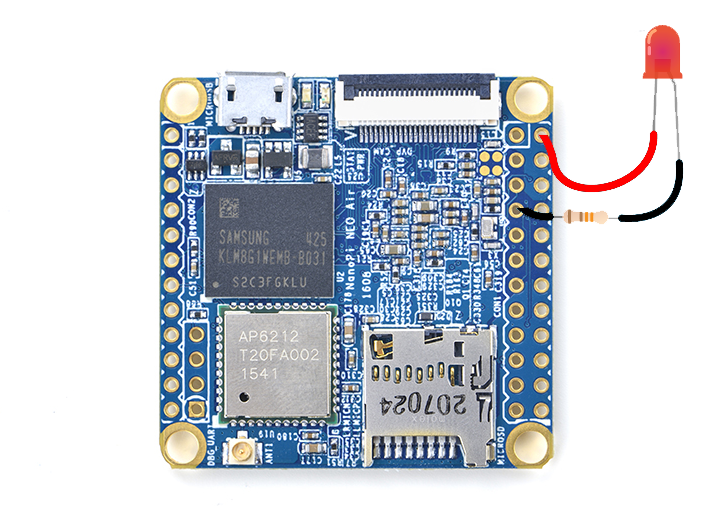 Its pins are compatible with the NanoPi NEO (v1.2) and its 24-pin header is compatible with Raspberry Pi's GPIO pin headers. The processor includes a Mali400 MP2 GPU but the board lacks an HDMI output connector, so the board can only be used for headless applications. For more information about installing OS on NEO Air and GPIO description, please read the wiki page. In this section, we will perform a simple electronic projects. Unfortunately, there wasn't a lot of information to get access to the GPIO pins. For this example, I used the matrix library. The matrix library has been developed by FriendlyARM for C language. Also, another similar library for Python language is being developed. After running the program, the LED starts blinking.